Ask the Blog: What’s Stretching Forward all about? I have decided to take part in the Teacher Challenge supported by Edublogs in order to expand my blogging. It’s a 30 day challenge, and I am hoping it will encourage me to become a more active blogger. Today’s challenge is to share information about this blog. 1. When did Stretching Forward begin? Stretching Forward’s first post was on June 29, 2009 and entitled Welcome to Stretching Forward. You can read the first post here. 2. Where did Stretching Forward get it’s name? 3. Why did you start this particular blog? The author used a personal blog at Live Journal for several years. However, she decided she really wanted to get into the habit of sharing professional information that she did not mind attaching her name to. Her goal initially was for this to be a place to share ideas, strategies, and reflections of her classroom activities. We also wanted to host the blog on a site that we had complete control over, which is why we are self hosted. 4. How many posts have there been on Stretching Forward? Stretching Forward has 38 posts (well, I guess this one makes 39). It’s not really as verbose as we imagined when we first started. 5. What was your most popular post? Stretching Forward’s most popular post was “Why you should sign up for the launch #NASATweetup for #STS133“. It received 971 hits and 13 comments, including a comment from a NASA Flight Director, and retweets of the post on Twitter by the official @NASA account! We were on top of the world that day. 6. What was your favorite post to share? I think the “My Top 10 in 2010” was my favorite to share. It was a great reflection of the amazing things my author did in 2010, and really helped her prioritize. On top of that, there were many other incredible opportunities she was not able to include in the post. 7. How do you track stats for the blog? Good question! I usually just automatically tweet the link on to Twitter with bit.ly and track hits that way. Of course, that misses people who directly type in the address. I definitely need to find a solution for better tracking of statistics. If you have a suggestion, please let me know. 8. This blog has had many different faces (layouts). Why? The blog author get bored easily. It’s part of the reason she changes up how she does things in her classroom every year. Hence the many changes to the face of the blog. Plus, it’s a lot easier to change a blog layout than it is to move furniture around! 9. What can you tell us about the author of the posts? Janelle Wilson is a sixth grade Earth Science teacher in the greater metro area Atlanta. This is her fifth year teaching science at her current school. This year, she teaches a standard course, a gifted course, and two accelerated courses. Janelle is very active on Twitter, and she is also a huge space geek. (That explains all the NASA posts.) She also began running last year. You can read a little bit more on the About page (which admittedly could do with some updating!). 10. What does the future hold for Stretching Forward? We are hoping to increase our postings this year. Specifically, the goal is to post at least three times a week. As you can see, that has not happened yet this year! We would also love to increase readership and interaction with our readers. We hope to share more specific ideas and strategies with actual lesson plans as we did here with a Rocks Unit. I am doing the teacher challenge too. Thanks for your post, I learned something new. I am on twitter but didn’t understand the bitly bit! Thanks for the link, I do now! Thanks for stopping by, Kathryn. Yes, I am a total science nerd; even my fellow science teachers believe that! I love Twitter; it’s such a great place to find ideas and interact with people. Thanks for commenting on my blog post for this challenge. I love how you have taken your passion and expanded upon it thanks to your social media connections. How cool is it that you had all those NASA experiences last year. I love the name of your blog and your explanation of why you chose it. Good luck with the challenge. Thanks for stopping by, Paula. Sometimes, I cannot believe all of the incredible experiences I have had just because I am active Twitter. I’ll be following along your progress throughout the challenge as well. G’day Janelle. I am really enjoying participating in this challenge and reading other’s blog posts. Yours is such an interesting story. I loved your comment on your most popular post. What an amazing number of hits to get on the post and to have the NASA Flight Director comment and the official NASA twitter handle tweet out the post, shows the potential power that blogging has to connect us to so many, including the community. Love your title and explanation of why you chose it. Thanks for dropping by, Anne. Yes, that post definitely let me see the potential of my blogging audience. Now if I can just keep it up! What a cool way to get kids excited about science! I’ll be passing it on to our science teachers at the middle school. Maybe it will inspire them to get blogging, too! I would love to see my kids expand their blogs to other subjects besides just language arts. We are doing web portfolios at my school with a few of the teachers and our students. Even though it might just be for science and language arts, we encourage them to include information from their other classes, too. Some really buy into it. We’re hoping to go school wide with our portfolios eventually, too. Of course, then we all fight over the computer labs, but that’s a good thing. I like the clean lines and uncluttered interface of your new blog template. I use a free live traffic feed from http://feedjit.com/ to get some stats from my blog (there’s a pro version as well, but I haven’t investigated what this offers yet). The plugin allows you to place a widget in a sidebar that displays where and when people accessed your blog. You can then go behind the scenes and see what browser people used, what website they were directed from (or whether than typed the URL itself) and even what search terms were used to land on a page. I always find it quite interesting to see these stats. Good luck for the teacher challenge! Jenny, Thanks for stopping by and leaving a comment. I’ll check out the stats app that you mentioned. I really need to track this better! Great post Janelle and I always like to see wordles that show ‘students’ as the focus. I really like the layout and clean lines of your blog too – great header image. I know what you mean about having control of your own site – that is something I need to investigate this year. Good luck with the blogging challenge and I look forward to reading more posts from a fellow science teacher! Thanks, Britt! I’m surprised “kids” isn’t on the wordle. On Twitter, I always call my students “my kids”. I do enjoy having control. It’s not too costly on a yearly basis, and for me, it is worth it. I’ll be following you along the challenge as well. Good luck! Great post…thanks for sharing what you have been up to. It’s wonderful to be learning and sharing with fellow science teachers from around the world. 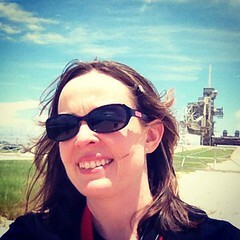 How exciting to be involved with NASA…such an authentic learning experience for your students. I use FeedBurner to keep an eye on what’s happening with my blog. Thanks for stopping by Penny! I’ll take a look at FeedBurner and see what it can do. I did find a nice plug-in called HitSniffer that I will write a post about soon. So far, it’s giving my great stats, and I have been able to track activity on my class site as well. Blog hopped here via Posts of the Week to read your interview. How great to get a comment from a NASA flight director. Space news gets a fairly high mention in our household. Thanks for stopping by, Mrs. S! It was amazing to get a comment from a NASA flight director. I’m glad to hear space news is important in your house! I am such a huge space geek, and the community around NASA is awesome. Hi Janelle, visiting as part of the teacher challenge. I love that you are able to so clearly articulate your love of science. I really enjoy reading blogs when the writers are so passionate about what they are talking about. Thanks for sharing. Jodie, thanks for your comment. I am definitely passionate about science, and I am really glad you are able to see that through my blog. I agree that passion is so important. I have really been enjoying reading your posts as well.